I’ve hand picked my favorite A-line skirts for this Fall. Find your perfect match and wear it effortlessly into the Fall season. I’ll show you how! This style adds a touch of detail and convenience with pockets. The olive color is always a popular hue during the Fall and Winter months. Wear it now by pairing it with a fun bright color like this bright pink! You wouldn’t think these two would pair well but they turn an otherwise Fall staple into a Summer showstopper. I’m wearing an olive green a-line button down by Jolt. 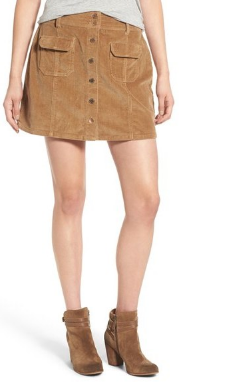 This style is sold out but they have a similar corduroy version here. Shop My Favorite Olive Green A-Lines Below! SANCTUARY HOLLY SKIRT : Orig. $99 Sale $49.99 Great if you prefer a longer length! This is my absolute favorite A-line not only because of the color, but also because of the classic suede. It’s very 60’s and I can’t wait to pair it with a bell sleeved top. Unfortunately it’s still a little warm for that here in Texas, but you can pair it with your favorite tank or off the shoulder piece! 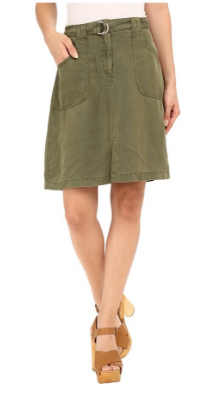 I’m wearing a skirt by Sanctuary and this style is actually on sale! Shop My Favorite Camel A-Lines Below!